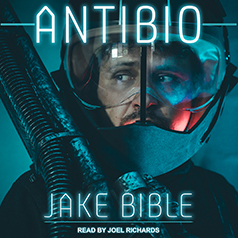 Jake Bible presents Book 1 of the AntiBio series. Antibiotics. They have failed. All that's left are the Strains—bacteria so strong they have brought the world to its knees. But humanity has fought on, carving out pockets of civilization in a wasteland known as the Sicklands, creating the super high-tech Clean Nation cities. And from the cities GenSOF has been born—Genetic Special Forces Operations. An elite military branch of the government that enlists men and women with specific genetic anomalies that allow them to be hosts to bacteria that even the Strains cannot defeat. Under the watchful eye of Control, GenSOF protects the Clean Nation cities from the ever encroaching Strains and the diseased inhabitants of the Sicklands. But now Control has other plans for GenSOF, and possibly the Clean Nation cities themselves, and it is up to the operators of GenSOF Zebra Squad, and their cloned Canine Units known as bug hounds, to find out what those plans are. Or die trying.